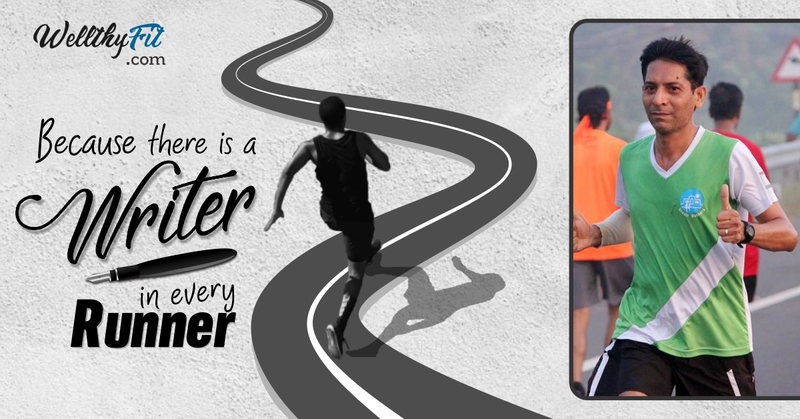 Satheesh Tandle is the first runner to have sent his article under my initiative- There is a Writer in every Runner! He introduces himself as an IT professional but also involved in transformation of students through life skills and leadership training. An avid runner, cyclist and yoga practitioner, he loves to travel and explore the world. I am not into ultras at all, and so enjoyed reading his experience on a place I have never been too. An important learning in this article for runners out there who plan to go the Ultra way – calf strengthening is quintessential for ultra running! The weather was awesome. And a big plus factor for anyone looking to do an ultra. And lovely views especially if you are doing 50 k and more runs. A decently well managed event with a few hiccups here and there. But then everyone has his/her own set of expectations. And any event is bound to fall short of cumulation of all those expectations. For the Wipro Chennai I put less focus on Yoga and more on running and I ended up with cramps at 33. But for the Kodai Ultra I made sure my yoga practice was on even though I had to miss the sessions and training runs. But did pick up on a few critical runs and sessions. Back of my mind I knew I had a 42 under my belt. So wanted to focus more on core strengthening. And I think it paid off. Not much of an issue during the run. On the go decisions to walk or run a particular stretch. On steep climbs used a strategy to run 100 metres and walk 100 metres alternatively. And believe me there were lengthy steep climbs, some stretching into kilometres. A good morning breakfast, two hours before the run, packed with carbo, nuts and banana got me going. And a small snack every 60 mins at aid stations was giving me decent energy to carry on. Besides I carried electral water and some chikki bars and it helped during the long stretches without aid stations. And this time around I relaxed, had a friendly chat with the volunteers, took time to hydrate and snack at the aid stations and did not forget to thank the volunteers before starting off again. The first stretch of almost 8 kms was mostly steep uphill. And I was wondering if I had made a big mistake in opting for an ultra. The roads were rugged and it was dark. The torch is an absolute necessity. It eased into a downhill run for 70% of next 12 kms. And I happily breezed through. At the next aid station, volunteers warned me of the upcoming challenge. Even steeper uphill and downhill for 3 kms. The real challenge started at 23. From then on until the 36th KM, it was uphill, uphill and uphill. And you get to go to the same aid station that you visited at 20. After that, no aid station until 35. It was like hell. And by now the sun had broken out too. Many people lost the will to carry on on this stretch. And started walking. I did not want to give up. And used the 100/100 plan. Anything beyond 100 was putting too much pressure on my calf. And that is where I realized that calf strengthening is quintessential for ultra running. One barefoot runner who was going really strong cramped at 35. And finished later than he actually deserved to. After 35 it was much better. But had to wade through a few stretches of crowded tourist spots and bad roads. And at 42, a mobile aid station provided some support and it was so pleasing for a few of us when we heard we had only 8 left. While we all thought it was another 10. Looping around the lake, ran for 3 and walked 1. And was joined by another runner. He was sure there was another 3 kms loop, as his gps showed only 48. And we were approaching finish point. Later we all discussed and figured out GPS tracking on the route was not giving correct numbers. Many had this issue. In fact, one person was so obsessed with his gps that after the finish line he ran loops inside the ground to complete 50 as per his gps. This is what I heard. Without judging, I just want to say that use gps if you want. But don’t follow it 100 %. Use it as a guide and not bible. So if your gps is showing more or less, don’t fret over it. My pacing indicated me that it was indeed 50. But we were told by anchor, before the race started, that it was actually 51. My run plan was to complete in 7.30 hours. But I finished in 7.10 hrs. And the person who accompanied me to finish line insisted on us finishing together even though I was a bit slower than him. And we knew each other for only 5 mins. You can know a person in 5 mins or 5 decades. And in this case 5 mins was more than enough. My objective is to share my experience. If you want to do an ultra then Kodai should definitely be considered. And kids cheering you along the way. Never experienced such a gesture in Chennai. Is Ultra Running the New Marathon?